Tiny Love Gymini Sunny Day Activity Gym Only $27 - Lowest Price! 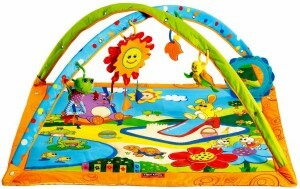 You are here: Home / Great Deals / Tiny Love Gymini Sunny Day Activity Gym Only $27 – Lowest Price! Tiny Love Gymini Sunny Day Activity Gym Only $27 – Lowest Price! If you have a little one or an upcoming baby shower, here’s an excellent gift idea! Get the Tiny Love Gymini Sunny Day Activity Gym for only $27 on Amazon (reg $44.99)! This has great reviews and is at it’s lowest price! Super Saver Shipping will be FREE with an order of $35 or more or get FREE 2-day shipping with Amazon Prime. Thanks, Saving My Family Money!